1. Use the arrows left and right of the gallery of images to horizontally scroll to the subject matter of interest. 2. Click on the image that represents the desired subject matter. 3. The desired subject will open in a new tab in your browser. If the subject matter is contained within a video, click play and so on. If the subject matter is an article, proceed to read as usual. 4. Opening the subject matter in a new tab in the browser allows for easy tracking of the current subject because the gallery stays at the current image in the tab at which the subject was selected. 5. 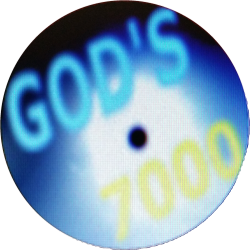 Clicking on the circular "GOD'S 7000" logo returns the gallery of subject images to the starting position. 6. When at a specific subject in a newly opened tab, clicking the same logo to the right of the video or article, sets that particular tab to the starting page where the gallery is at the starting position. 7. Alternatively to the gallery, the table of contents button will open the table of contents in a new browser tab. By hovering over each topic listed, a short description of the subject appears in a tooltip. Clicking on the item in the table of contents results in opening the subject matter in a new browser tab in the same way as it is opened when clicking on a gallery image.